AD = axial diameter; CD = cornea diameter; HBL = head and body length. those at very small body sizes (Kiltie, 2000) and all diurnal and nocturnal primates. However, as noted elsewhere (Ross, 2000), the relationship between these variables across all mammals is not linear, being positively allometric at small body sizes and negatively allometric at large body sizes. Because small primates have relatively larger eyes than other mammals, the primate slopes are significantly less steep than those for all mammals combined. Figure 6 plots axial diameter of the eye against head and body length in extant primates and birds. Tarsiers fall within the range of nocturnal birds, i.e., Strigiformes (owls), Caprimulgidae (nightjars), and Podargidae (frog-mouths). Most of the diurnal birds lying between the nocturnal bird and diurnal primate distributions are falconiforms (Hall, 2005). The rest of the diurnal birds are parrots, pigeons, and procellariform sea-birds, which fall among and below the primate distributions. Across nocturnal and diurnal birds, eye axial diameter is negatively allometric. However, the 95% confidence limits for the slope across nocturnal birds almost include 1.00 (= 0.99), a slope significantly steeper than that of primates. Figure 5. 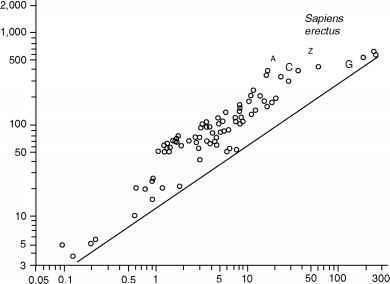 Bivariate plot of axial diameter (log10) against head and body length (log10) across all mammals. Minimum spanning polygons for nocturnal primates and diurnal primates are added. 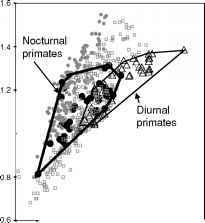 Nocturnal primates have longer axial lengths for their body size than similarly sized nonprimate mammals.